If you are looking for cool paintball fields then look no further then Action Packed Paintball. Action Packed is the twin cities? premiere outdoor paintball park. Groups and individuals alike are welcome, or call ahead to reserve a spot on one of our many cool paintball fields for your next party or event. Walk on play is also available for groups of less than eight players. The experienced and friendly staff will set you up with safety gear, CO2, and compressed air. After that, let the game begin. Action Packed Paintball has a wide variety of games and scenarios to choose from. 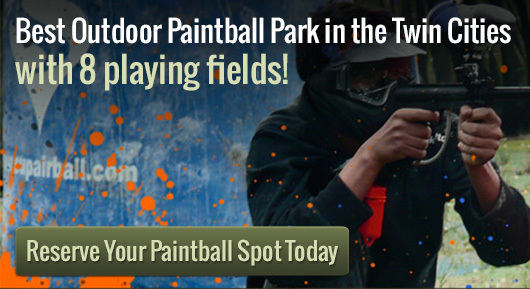 You can also select which of the cool paintball fields you want to play on. Speedball is fast moving on a field set up for adrenaline packed play, while Woodsball relies on concealment and stealth abilities. The Woodsball Fields are traditional wooded paintball at its finest. Stage an ambush or take cover behind brush and sandbag walls. You can also play out fantasy scenarios on many of the cool paintball fields. The City of Tombstone field is an old west town where you can play like gunslingers in the streets, or battle one another from one room to the next. Firebase Alpha is where you?ll need to fight your way out through the surrounding forces. Have a true battle on the Civil War field. Line up for face-to-face battle just like the Blue and the Gray did. The Jungle allows you to use your cunning maneuvers to outwit the opponent. Badlandz rounds out the playing field choices. Here the game boils down to a ?who sees who first? fight to the finish.